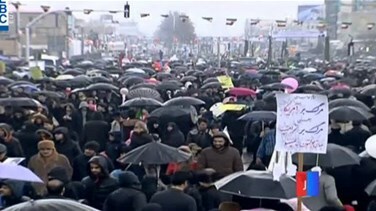 The large turnout in state-sponsored rallies came as Iranians face mounting economic hardships many blame on the country's clerical leaders. In a speech at Tehran's Azadi (Freedom) square, Rouhani said U.S. efforts to isolate Iran would fail. "We will not let America become victorious Iranian people have and will have some economic difficulties but we will overcome the problems by helping each other," he said. Yadollah Javani, the Revolutionary Guards deputy head for political affairs, said Iran would demolish cities in Israel to the ground if the United States attacked the Islamic Republic. "The United States does not have the courage to shoot a single bullet at us despite all its defensive and military assets," he was quoted as saying by state news agency IRNA. State TV showed a cartoon of the Shah being thrown into the "dustbin of history", wearing clothes in U.S. colours and holding Iranian newspapers headlined "The Shah has left!" Today, the United States and its Arab allies are trying to counter Tehran's growing influence in the Middle East, where it has proxies in Iraq, Syria, Lebanon and Yemen.